GolfSites is probably the most comprehensive golf helper and stats app on the App Store, which is saying something, as there are quite a few of them available, but GolfSites does blow most of them out of the water with its offering. The first thing that I have to mention is the sheer accuracy of the app. 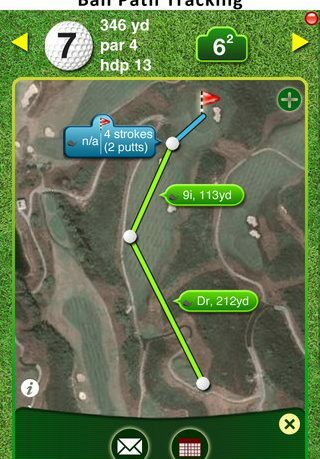 Wheres most apps can get your location pretty well, GolfSites nails it with an error of no more than 1-5 yards, which is extremely impressive. No longer will you be confused by inferior apps that may accidentally mislead you, messing up your stats in the meantime. The app includes an incredible 20,000 golf course layouts from around the world, a level of content that just can’t be questioned. ♦ Unlock the power of your GolfSites without ever taking your head out of the game with one click tracking and our intuitive Location Scoring System! ♦ Unlike other conventional golf apps that only let users key in the estimated distances of their drives, putts, and the like, GolfSites’ ball path tracking system gives you stroke measurements that are accurate down to within 1-5 yards. ♦ Our revolutionary ball path tracking feature lets track your play with utter precision, and all it takes is a single click before or right after you swing to mark your location. 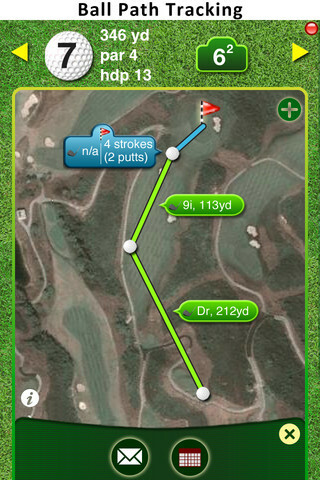 You can now view GolfSites’ Ball Path after every hole too! ♦ Inputting the type of club your using and surface you’re hitting from on any given swing can be done in 2 clicks and without any scrolling in GolfSites. Simply put: It takes less time to do than reading this sentence just did. ♦ The information GolfSites gathers as you play doesn’t go to waste. Your game stats are crunched and graphed. You’ll be able to review everything from average hitting distances with specific clubs and swing accuracy readouts, to average strokes by par difficulty, putting performance, and more. ♦ GolfSites lets you view your game stats either overall or by your performance history on specific courses to give you a better idea of how you tend to play at different courses! Obviously, this is all very impressive, but perhaps the best thing about the app is how the developer has managed to squeeze all this content, and the amount of features, into such an easy to use interface. You may expect to be constantly fiddling with menus to get at all the extra content, but no, with just a few taps you can be using any part of the app in both an intuitive and easy way. The app also happens to be very good looking, and overall, this app could represent a worthy investment for any budding golfers out there.